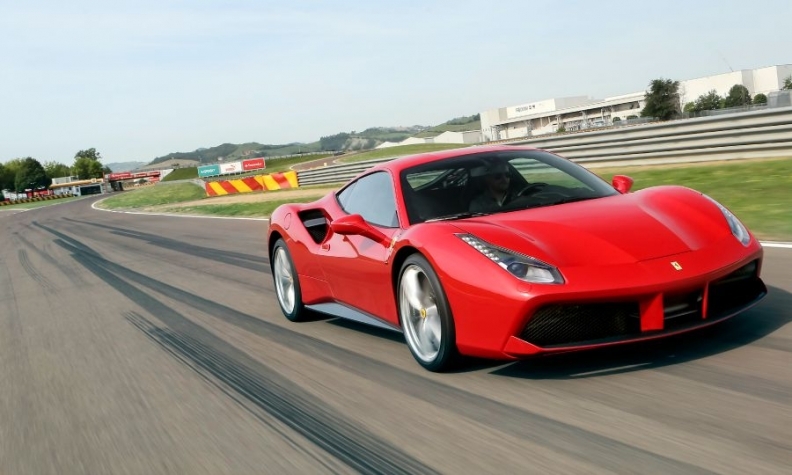 Ferrari says the 488 GTB is its most powerful yet least polluting V-8 model ever. MILAN -- Ferrari reported a 38 percent rise in fourth-quarter adjusted core earnings and gave a strong guidance for 2017. Ferrari, which was spun off from Fiat Chrysler Automobiles at the start of last year, said in a statement Thursday that adjusted earnings before interest, tax, depreciation and amortization (EBITDA) in October-December rose to 251 million euros ($271 million). Quarterly sales were up 12 percent, also above expectations, helped by sales of its 12-cylinder models such as the GTC4Lusso and the newly-launched LaFerrari Aperta hybrid convertible. It proposed a cash dividend of 0.635 euros per share. Spun off from Fiat Chrysler, Ferrari has been under pressure to show it can increase profits without the backing of a large parent and lift sales without sacrificing the brand's exclusive status. Ferrari will celebrate its 70th anniversary this year with a series of tailor-made cars, all inspired by iconic models from its past. Overall, the group plans to ship around 8,400 vehicles in 2017, getting closer to the 9,000 goal it has set for 2019. Beyond special editions, Ferrari has been trying to expand its appeal with cars that have characteristics other than the technological prowess of its recent 8-cylinder and 12-cylinder models. It bills the GTC4Lusso T, a four-seater with a smaller V8 turbo engine, as "designed to be driven every day." Ferrari forecast a 2017 adjusted EBITDA of more than 950 million euros and sales above 3.3 billion euros. A big contributor will be deliveries of the 1.86 million-euro hybrid convertible and the anniversary models. At the time of the IPO, CEO Sergio Marchionne promised to expand the luxury brand beyond cars and recently said Ferrari's focus would be on vehicles first. He said from 2019 all vehicles sold would have some hybrid elements, potentially opening the way for shipments to grow substantially in future. At the moment, Ferrari is exempt from certain fuel economy and emissions requirements provided it sells fewer than 10,000 vehicles a year.